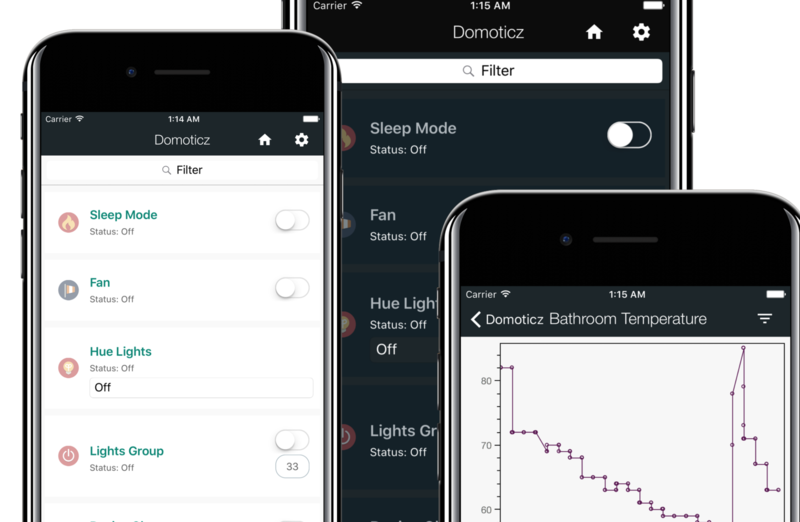 Domoticz is a very light weight home automation system that lets you monitor and configure various devices! 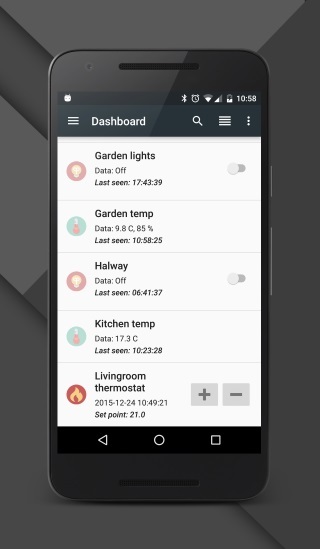 Open Source Home Automation System!! 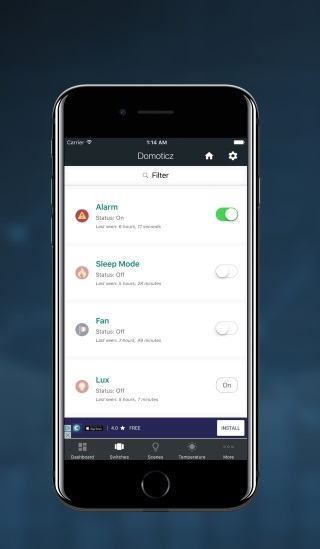 Control and monitor your home devices like lights, switches, fans, various sensors/meters like temperature, rainfall, wind, Ultraviolet (UV) radiation, electricity usage/production, gas consumption, water consumption and much more at your fingertips with the most coolest automation system "Domoticz - Home Automation". The app automates every appliance at your home and you can control it through the mobile device from any place. Turn off or on the bedroom lights sitting at living room. 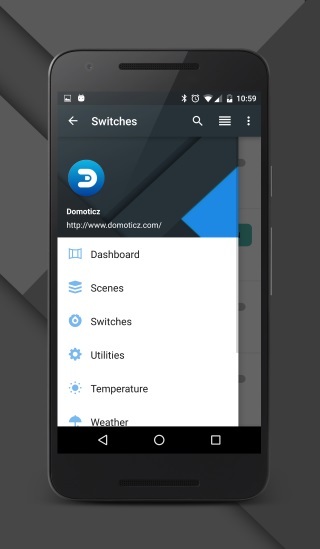 "Domoticz - Home Automation" app supports NFC and allows you to switch on the AC or other appliances when you are almost reaching home. Through geo fencing feature the app can detect your location and accordingly alerts you with the managing of the devices. 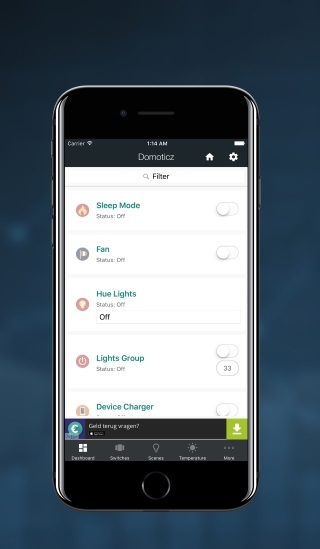 Install Domoticz and start with home automation today! 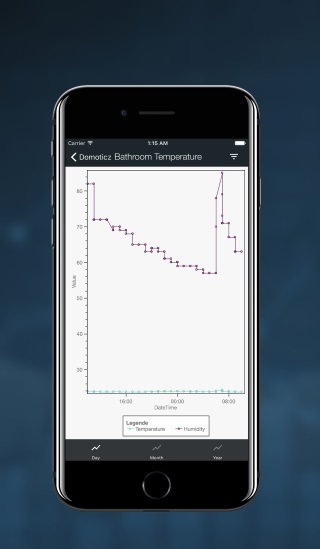 You can connect lots of devices with Domoticz, like lights, switches, various sensors/meters like temperature, rainfall, wind, Ultraviolet (UV) radiation, electricity usage/production, gas consumption, water consumption and much more. 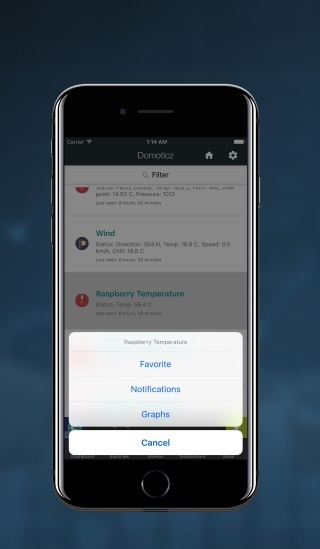 The app "Domoticz" has a great user interface with easy user controls. 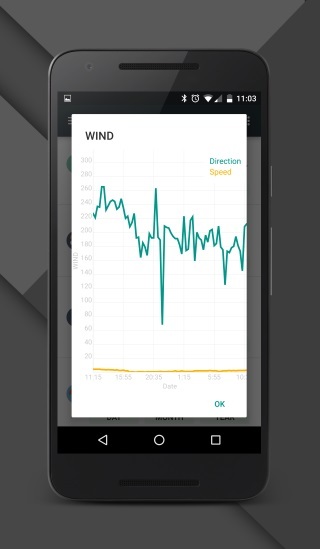 The app also supports widgets that helps you control from your mobile home screen directly saving your time to turn on or turn off the device. The app is perfect to save the unnecessary electric consumption thereby saving the money. Be personalized and get your control in your fingertips. The automatic device controller app "Domoticz" supports finger print feature to ensure the security of your devices. Monitor the gas and electric consumption from your mobile device and configure its usage as per your requirements and budget. The app is the best to plan your monthly budget over various devices. The app also sends the push notification to any configured mobile device to alert you with the usages and consumptions. Say Hello via the Forum! Having issues, feature request or just like to contact us? 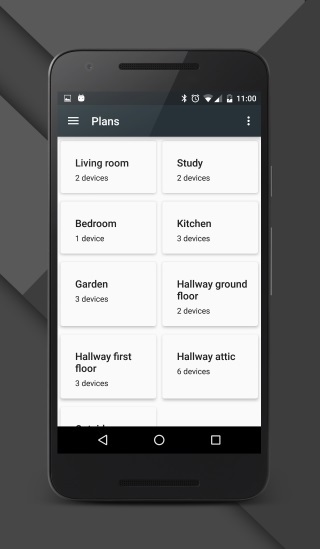 Please try out Domoticz as the bases system for you home automatision! @galadril: Check out Github for the latest issues, source code and discussions.